Although most reptiles lay eggs as their method of reproduction, several species are live-bearers, or viviparous. Viviparity in lizards is most often seen where cooler, drier temperatures reign, such as high-altitude mountainous areas. Viviparity isn't limited to a certain family or type of lizard; some genera even have both oviparous and viviparous species. Both oviparity and viviparity have their benefits, either for the mother or the offspring. The benefits of oviparity include less distress -- and shorter periods of any distress -- on the mother and her body, higher probability of multiple clutches, eggs may survive in the event of the mother's death, and greater genetic diversity due to the possibility of multiple matings. Viviparity, on the other hand, offers protection from environmental sources, thermoregulation, the mother gives her commitment throughout pregnancy rather than all at once, and the mother can place her young in a more optimal site. While live-bearing in lizards is often connected to those that live in colder climates, primarily because the offspring are protected from the cold temperatures inside their mothers, some tropical species exhibit live births, including 40 members of the widely diverse Phrynosomatidae; this family includes the common horned lizards, as well as arboreal and other terrestrial lizards. An analysis of live-bearing lizards in this group surprisingly revealed that viviparity originated in tropical, low-latitude, albeit in the higher elevations of these areas. Jackson's chameleon (Chamaeleo jacksonii) is a viviparous example in the genus Chamaeleo. Schmidt's helmet skink (Tribolonotus schmidti) bears a single, live young. 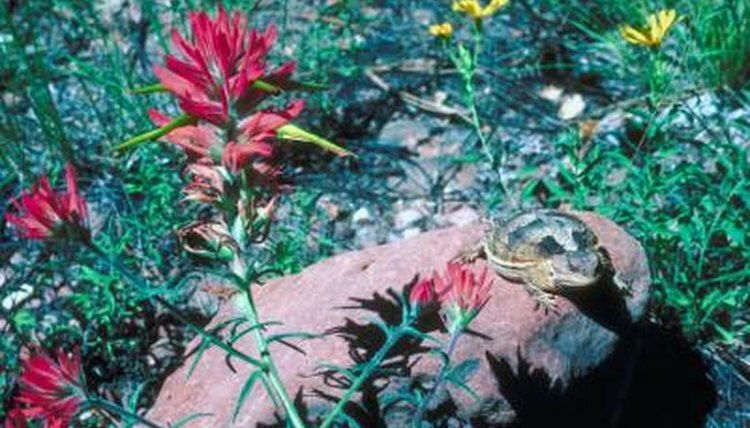 Closely related to the horned lizards, the crevice spiny lizard (Sceloporus poinsettii) occurs in the Southwest and gives birth to live young in early to mid-summer. Other genera with live-bearing species include Phrynocephalus in the family Agamidae; Diplosglossus and Gerrhonotus in the family Anguidae; Lacerta in the family Lacertidae; Corytophanes, Liolaemus and Phrynosoma in the family Iguanidae; and Eumeces, Leiolopisma, Leptosiaphos, Mabuya, Riopa, Scinella, Sphenomorphus and Lerista in the family Scincidae. Average gestation periods range between two and three months for viviparous lizards, but can be as long as seven months. One lizard's common name is vivparous lizard (Zootoca vivipara), although it is also known as the European common lizard. The slow worm (Anguis fragilis), is a small, legless European viviparous lizard. In North America, many species of horned lizards (Phrynosoma), are common viviparous lizards; viviparous horned lizards are common in drier and colder mountain climates in North America. In the early 2000s, a new species of viviparous lizard was discovered in New Caledonia: Kanakysaurus viviparous. For How Long Do Lizards Stay With Their Mothers? Do Lizards Come Out at Night? When Does Your Guinea Pig Mature? How Long Do Frilled Lizards Live in Captivity? Why Do Some Animals Have Large Litters?